Using the auto mechanic’s model, I’ve taken our practice’s actual expenses for 2010 and broken them down by category, as well as percent of our total budget, to give you an idea of where the money goes. Utilities and rent: 10% We spend a tenth of our budget just keeping the lights on, the telephone ringing, the heat and A/C running, and the rent paid. Supplies: 9% Nearly another tenth of our expenses go to supplies, both clerical (appointment cards, copy paper, and pens) and medical (gauze pads, diapers, and casting supplies.) The largest single supply expense we have is vaccines; it’s not uncommon for a busy pediatric practice to have many thousands of dollars in vaccine inventory at a time. Clinical staff: 13% Our nurses and medical assistants are busy from open to close – they weigh and measure our patients, draw blood, give shots, answer medical questions, complete school and camp forms, return phone calls, coordinate referrals, talk to the home health agency, refill prescriptions with the pharmacy. All these astute individuals are friendly and talented; we want to keep them, so we try to pay them well. Receptionists: 5% Our front office staff answer the phone, verify insurance, check in patients, distribute paperwork, send and receive medical records, mail and fax documents, process co-payments, confirm appointments, order supplies, and more. Insurance jockeys: 4% We don’t have “car jockeys,” but we do employ three full-time staff who could be described as “insurance jockeys.” These longsuffering individuals send claims to insurance companies (a big task) and argue with insurance companies when payments aren’t made properly (an enormous task, as it’s estimated that 20% of insurance payments are wrong.) They try to keep up with policy changes in the 200+ insurance plans our office sees in a year. They also work with families who need to establish payment plans, need to get insurance, or who are having trouble navigating their insurance plan. Supervisory staff: 8% All our other staff have to be trained and supervised. Someone has to approve their mileage forms, overtime requests, time clock totals, and benefits changes. Someone has to negotiate scheduling squabbles, process payroll, conduct staff meetings, plan the office’s Christmas party, write policies (then rewrite them when they’re unclear), meet with vendors, fix the computers when they’re acting up, call a plumber when a toddler accidentally flushes a toy down the toilet, and about 384 other major and minor things to keep our office running. These staff also have associated professional costs, like dues and subscriptions. Building maintenance: 4% Keeping our office clean and well-maintained is hard work for the husband-and-wife team who spend several hours 5 evenings a week cleaning, disinfecting, dusting, vacuuming, waxing, touching up the paint, wiping fingerprints from walls, emptying the trash, getting bugs out of the light fixtures, and more. Seasonally, we also pay a landscaping service (to maintain our grass and plantings) and a guy with a big truck (to salt and de-ice our parking lot). This also includes budgeting for major repairs, like resealing and restriping our parking lot every couple of years, fixing leaks in the ceiling, and cleaning up fallen debris after a bad storm. Specialized physician training: 22%. This represents the salaries for the pediatricians in our practice and, yes, paying the doctor is the largest single expense in a practice. Much of this goes to the doctor’s personal overhead: Physicians now graduate med school with an average of $150,000 in educational debt. Capital investment: 6% We use electronic medical records at our office, so all of our staff have their own computers, and there are computers in each of our exam rooms. Computers have to be replaced every few years, as do other electronics, furniture, appliances, and tools. Taxes: 6% The largest part is payroll taxes for our employees and self-employment taxes for our physicians – but also unemployment tax (federal and state), property tax, professional privilege (license) tax, and sales tax. Insurance: 7% We pay malpractice insurance for our professional employees, of course, but also insurance on our building and equipment, health/dental/life/disability for our employees, worker’s comp insurance, and some other odds-and-ends premiums. Fringe pay: 5% This includes vacation/sick pay, holiday pay, and our company’s contributions to our staff retirement plan. Wage and hour regulations: 1% Overtime wages for our employee constitute nearly 1% of our total annual expenses. When you pay your pediatrician’s bill, your pediatrician certainly takes home a portion of that, but most of it goes to other things to keep the office ready and running. While our practice isn’t necessarily representative of all pediatric practices – and I know from published benchmarks that our practice is atypical in at least a few ways — this hopefully gives a rough idea of where the pediatric healthcare dollar goes. Suzanne Berman is a practicing general pediatrician in rural Tennessee. First of all, realize it’s inevitable: Children will get sick. I have yet to meet a child in school who went the whole school year without coming down with something. That being said, there are measures we can take to lessen the chances of our children falling prey to some of these viruses. First, I will outline 5 of the most common culprits causing illness in the preschool and school age child during fall and winter. Then I will give you some practical tips on containing these viral bugs. Hand Foot Mouth Disease: This is most commonly caused by the coxsackie virus and peaks in the summer and early Fall. This virus affects mostly young children (children under 10). The symptoms consist of a fever, decreased appetite, and sore throat. Usually painful mouth sores develop on the tongue, inside of cheeks and back of throat. This may or may not be accompanied by the non-itchy skin rash on palms and soles of feet. The Common Cold: Your child may be afflicted with this a few times a year. The most common culprit here is the rhinovirus though there are several different viral strains producing symptoms of the common cold. Hence, several colds can be caught during one season. The symptoms vary but most commonly include: stuffy nose, sore throat, cough, mild fever, and sneezing. The Flu: Ahh… the dreaded flu. Influenza and its various strains cause the dreaded flu symptoms. As opposed to the common cold, the flu gives more pronounced and severe symptoms: high fever (usually over 100.4), sudden onset of symptoms, profound body aches, headache, and general malaise with decreased appetite. With the common cold, respiratory symptoms such as sneezing, congestion and cough are more prominent than in the flu. So far, the only preventive medical defense we have against this is the seasonal flu shot. Strep Throat: Unlike the above conditions, this one is caused by a bacteria (Group A Strep.) and not a virus. So, this must be treated with antibiotics. So how do you tell the difference from a common sore throat (viral pharyngitis) and strep throat? Here are the key differences: strep throat involves a higher fever (usually above 101 F), red and swollen throat with possible pus formation, absence of cough, and swollen lymph nodes in neck. Strep throat may also be accompanied by abdominal pain, possible vomiting, and a body rash. Gastroenteritis, aka the “stomach flu,” is caused by several different types of viruses, most notably rotavirus and adenovirus. The most prominent symptoms are vomiting and diarrhea. Some children may only have the vomiting, some only the diarrhea, and the unlucky ones will have both. This may be accompanied by fever and stomach ache. Having the so-called “stomach flu” does not mean you have the “flu” as in influenza. I picked the above 5 conditions because they are by far the most common this time of year and they are highly contagious. There is just no way around it. Okay, so having thrown all that at you, what can you do to help minimize and contain these nasty viruses? Frequent hand washing is the number one way to help prevent the spread of these bugs. Encourage and teach your child to wash their hands several times throughout the day. Before eating, after using the potty, after playing outside, etc. Have them sing a song while washing to make sure they wash long enough (ABC song is a good one). Carry sanitizer. I always wipe my kids’ hands as soon as they get into the car from school. This time of year, it’s just a good habit. Wipe down shopping cart handles too. 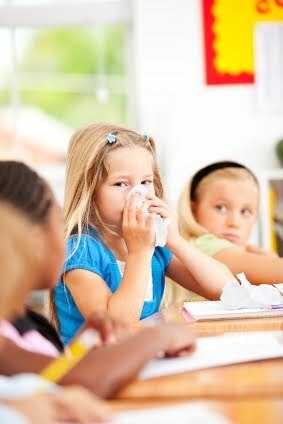 Encourage children to sneeze and cough into their arms or a tissue. Keep children home if they have a fever, are vomiting, or have significant diarrhea. Of special note: keep them home if they have eye drainage, this could signify a conjunctivitis and should be evaluated by a doctor. Teach them not to share drinking cups or utensils with their friends. By all means, sanitize the toys and personal items in your house after a bout with any of the above. Make sure your children get enough sleep, eat well balanced meals, and exercise regularly. All of these will help insure that their immune systems stay in tip top shape. Treatment: Since the above, with the exception of strep throat, are caused by viruses, antibiotics will not help. Keep your child comfortable by treating their fever with a fever reducer. Give plenty of fluids and rest. With the stomach flu, keep your child’s diet bland and make sure they stay hydrated with small and frequent amounts of liquids. Possible Complications: Secondary infections can set in following colds or the flu. Ear infections and pneumonia are common secondary infections. Watch for fever recurrence, chest pain, difficulty breathing, or worsening cough. Dehydration can set in following a bout of gastroenteritis. Stay on top of your child’s liquid intake. These conditions should be evaluated by your child’s pediatrician. Do not hesitate to contact your child’s pediatrician whenever you’re concerned or have questions regarding your child’s health. Good luck to all of you this fall and winter season. Unfortunately, these bugs will make their way into our households — just make sure your child gets plenty of rest, fluids, and love. We’ve already battled a short bout of gastroenteritis and a nagging cold. How about you? Have your children been afflicted by any of these back to school bugs yet? Dr. Arca is a pediatrician, mom of two, writer, and blogger who works part time in a community clinic while raising her two young children. She has become passionate about writing and speaking about motherhood, parenting, and children’s health. She is author of the blog, Confessions of a Dr.Mom and writes a weekly column in her local newspaper, The Sacramento Bee. It was with great sadness that I read of the third case of Naegleria fowleri infection (the “brain-eating amoeba) this summer. Death in children is always tragic, but especially so when it is so unexpected and brought on by something so innocent as hitting the local swimming hole. As a physician, I expected parents to be asking about it in the coming days and weeks, so decided to educate myself. I thought I would write how I went about it, and how I think about it, as there are some good things to be learned about how to find medical info AND interpret it. b) Some things are just tragic. The CDC site makes an important point, which is that over 10 years there’s been 32 cases of this disease, but millions of people have gone swimming in these same places and NOT gotten this disease. We’ll probably never know why these very few kids get the disease and the vast majority do not. c) Modern medicine doesn’t have all the answers, yet. This disease is almost uniformly fatal because it often is not recognized as Naegleria until late in the illness (or even post-mortem), and there is not a good treatment even when it is diagnosed early. If we can develop better methods of detection and better treatments, the prognosis for these kids may improve. d) Educate yourself. The vast majority of cases are in southern states, in fresh water, and usually in warmer water (hot springs, etc). There’s been only one case in a northern state (Minnesota). So if you are going to the beach for a week on the Jersey shore, you can relax. f) Remember what’s important. Remember the 32 cases in 10 years noted above? In a typical 10 year span, there are 36,000 drownings in the US. Drownings don’t make national headlines like brain-eating amoeba do, but your child is literally 1000 times more likely to drown than to catch Naegleria. So don’t lose sleep over the brain-eating amoeba but then take your child on a boat without a life jacket. I hope this glimpse into the brain of a pediatrician was helpful. I would also like to extend our sincerest condolences to the families of these children; we can only hope that the increased public awareness from these cases leads to work on an effective treatment. Dr. Sullo is a pediatrician at Genesis Pediatrics in Rochester, New York. He admits to having gone to computer camp in 5th grade when everyone else was playing baseball, and is an “Apple Fanboy.” He does his best to offset the geekiness by throwing in some winter backpacking. When Should My child Start Seeing My Adult Physician? My answer is not until their early 20’s. 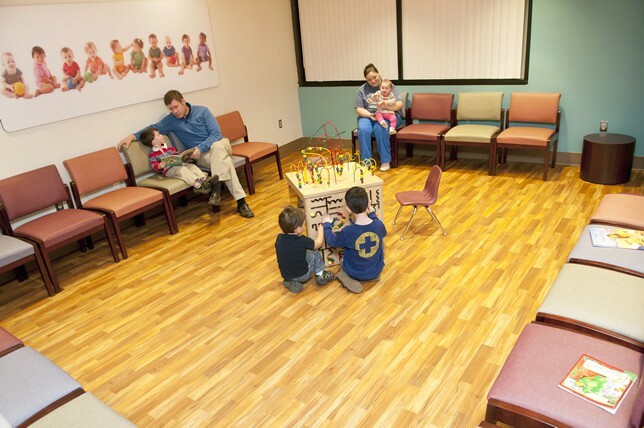 Pediatricians are trained to treat babies, toddlers, children, adolescents and young adults. Pediatric training encompasses four years of medical school and a minimum of three years of residency in pediatrics. Throughout our career, we are constantly attending conferences and reading journals or medical literature to ensure that we are always current and apprised of cutting-edge pediatric medicine. Your pediatrician helps you deal with your baby’s acid reflux, guides you on how and when to introduce solid foods and thrills with you when your baby speaks his/her first words. At your well visits, your pediatrician asks questions to determine if your infant/child is developing properly and if not, you will be directed to the proper place for evaluation. You are counseled on proper nutrition and exercise for your child and encouraged to expose your child to a range of cultural and educational experiences. When your child is wheezing or crouping in the middle of the night, it’s your pediatrician you call on for help. When your child has a 104 degree fever on a Sunday morning your pediatrician tells you to come over to the office to be examined. It is your pediatrician who is there with you as your child becomes an adolescent and together we deal with adolescent issues such as acne or uncomfortable menstrual cycles. With some of you, we traverse the difficult terrain of painful adolescent anxieties or drug and alcohol problems. It is your pediatrician you consult for concussions and sprains from sports. When your child begins thinking of college and a future career, your pediatrician is as excited as you are, because your pediatrician has been there with you as your child has grown into a young adult. It is your pediatrician who takes your child’s phone calls from college to help with a health issue or an emotional problem. When it becomes time to move on to an internist, it is a happy but also sad parting of the ways. And then of course the fun begins again as your pediatrician begins to care for your child’s child: a very special pleasure for your pediatrician — the second generation. As you can see, there is no other healthcare professional who knows your child the way your pediatrician knows your child. The walk-in clinic has no frame of reference; they have not treated your child throughout the years. Many internists and family practitioners do not treat large numbers of children and are therefore not equipped to handle the range of issues involved in treating children and adolescents. Many non-pediatrician physicians do not have the vaccines needed to keep your child properly immunized. Most do not see patients after hours; they send patients to the emergency department. With your pediatrician you have grown accustomed to being seen right away and in the office where you are comfortable. Your pediatrician has been trained to deal with your child’s health issues from birth until they are young adults. We know your family and we know your child’s history. We know you and we are always there for you. Dr. Lander has been practicing pediatrics for 32 years in New Jersey and is the immediate past chairman of the American Academy of Pediatrics Section on Administration and Practice Management. He says if he had to do it all over again he wouldn’t hesitate to be a pediatrician. Does Your Child Need to Wear a Helmet When Riding? The American Academy of Pediatrics reminds us that head injuries can occur on sidewalks, on driveways, on bike paths, and in parks as well as on streets. You cannot predict when a fall from a bike will occur. It’s important to wear a helmet on every ride. Below are four suggestion that could help you get into the habit of telling your kids to wear a helmet. Are you wearing a helmet? We’ve all heard the saying, “…do as I say, not as I do.” But the truth is, children learn best by observing you. Thus, whenever you ride a bike, set a good example and put on your helmet. Not only will this reinforce the message, but you will be setting a good example. Start Early. If your kids are small, have your kids wear a helmet as soon as they start to ride a tricycle or when they are riding as a passenger on the back of an adult’s bike. If your children learn to wear helmets whenever they ride tricycles and bikes, it becomes a habit for a lifetime. No helmet; no bike riding. Don’t let children ride their bikes unless they wear their helmets. Being consistent is a big part of the process. If you allow your children to ride occasionally without their helmets, they won’t believe that helmet use really is important. Use professional athletes as examples. My husband likes to watch the X-Games. For those that don’t know, X-Games are a yearly competition where athletes perform extreme sports such as skateboarding, roller-blading, motorcycle jumping and various other high risk, death defying stunts. All of those athletes wear helmets at all times. Thus, using professional athletes such as those on the X-Games as an example, drives the message home of how important the use of helmets can be. Your child needs to wear a helmet on every bike ride, no matter how short or how close to home. Many accidents happen in driveways, on sidewalks, and on bike paths, not just on streets. In fact, the majority of bike crashes happen near home. A helmet protects your child from serious injury, and should always be worn. And remember, wearing a helmet at all times helps children develop the helmet habit. Thankfully, both patients are doing fine. But these incidents are a sure way to remind parents that helmets are very, very important and should always be worn when bike riding, roller-blading or playing hockey. No exceptions! Children younger than 5 years, especially boys, are at greatest risk from drowning in swimming pools. The words startled me as pediatrician but as Mama, too. Three thousand children under the age of 5 were treated in the ER each year between 2006-2008 for injuries associated with submersions. Private pools were the riskiest pools of all. Over half of the children who drowned and died (129/209) did so at their own home. Wrong, terrible, traumatic. Dr. Swanson practicing pediatrician and the mother of two young boys. She sees patients at The Everett Clinic in Mill Creek, Washington. She is also on the medical staff at Seattle Children’s and am a Clinical Instructor in theDepartment of Pediatrics at the University of Washington. Dr. Swanson is passionate about improving the way media discusses pediatric health news and influences parents’ decisions when caring for their children.